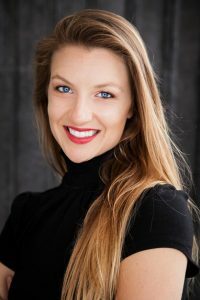 Erin holds a Bachelor of Arts in Vocal Performance from University of Minnesota and is an active performer, educator and entrepreneur whose participation in the San Diego vocal arts and theatre community has a wide span. Solo and ensemble performances include “Le Nozze di Figaro,” “RENT,” “Evita,” “Night & Day,” “The Hunchback of Notre Dame,” choral performances with the San Diego Symphony, Sacra Profana Professional Chorus, private events and cabaret shows. Erin has taught since 2007 in private, community and K-12 settings including Gymboree, Young Audiences of San Diego, Junior Theatre of Balboa Park, San Diego Unified School District, and Cajon Valley School District. Erin founded Prodigy School of Arts, a school for the visual and performing arts in La Jolla, which was sold to new ownership in 2013, and worked in higher education administration for six years at the Grossmont Cuyamaca Community College District. In her spare time Erin enjoys languages, travel, food & wine, volleyball and dance.